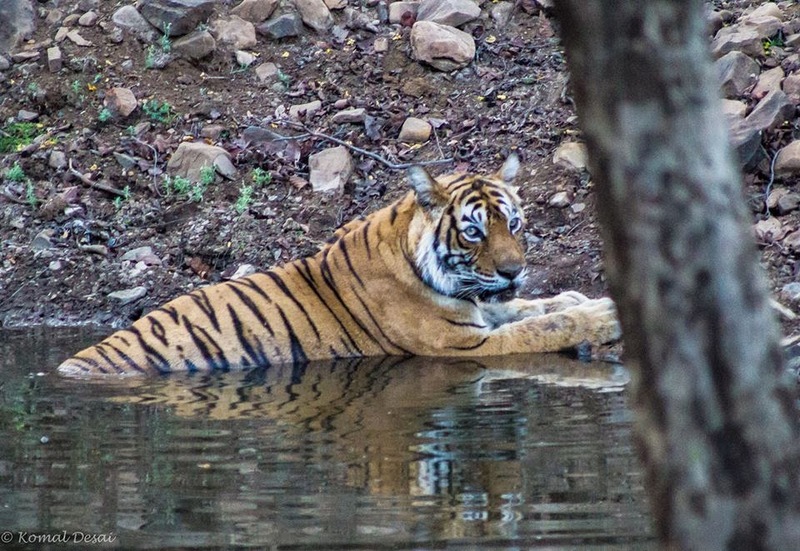 Tiger Tales from Ranthambore || T-16 or "Lady of the Lake" AKA "Machali"
 Home  #SaveOurTigers  Conservation  Machali  Project Tiger  ranthambore  Tiger  Tigress  wildlife  Tiger Tales from Ranthambore || T-16 or "Lady of the Lake" AKA "Machali"
A Lifetime Achievement Award! A Facebook Fan Page! And no! We aren't talking about a veteran Bollywood actor. It is none other than the "Lady of the Lake", or T-16, the undisputed matriarch, the proud grandmother of most of the cubs now learning to take their first steps in the rugged forests of Ranthambore. Also known as "Machali", a name she has inherited from her mother, she is mostly sighted cooling herself in one of the many water bodies in her territory. And even though her once glossy coat is now losing its shine and she has lost most of her canines, few would guess that the graceful tigress has now been on the prowl for the past 18 years, much longer than the average lifespan of Royal Bengal Tigers. The tigress has led an eventful life and one wonders what memories haunt her as she lazes around in water enjoying her semi-retirement, "semi-" because a tiger in a jungle can never really afford to take it easy, especially when the woods nearby are teeming with several young males of the same species. Is she reliving one of her many fights with the giant crocodiles, in which she managed to kill no less than 8 of them? Or is she nostalgic about her several romantic partners, none of whom are alive now as she has outlived them by several years? Or is she reveling in the phantom antics of her several cubs, one of whom, T-17, turned against her and drove her out of her territory - a defeat that would have broken her heart, but nevertheless made her proud of how well she has brought up her cubs? What is it she thinks of night and day? Once feared by even the most ferocious full-grown male tigers of the park, Machali has quite a few achievements she can be proud of. The fact that most of her cubs attained adulthood in the face of all odds can only be attributed to her exemplary parenting skills and courage. She has been known to take on the largest of the tigers to protect her cubs. Is it one of these legendary fights that she is pondering upon? Now that she is fast losing strength and is unable to hunt, her human friends are doing their best to keep her well fed and healthy by tying goats at a comfortable distance for her to kill. She nevertheless manages to give them a panic attack every now and then by putting up a vanishing act. Is it this warm relationship with humans that she is analyzing silently? One can never know! Tigers are solitary animals, and what memories they hold dear remain a secret, known only to them. Stoic and contemplative, each tiger takes its life's joys, sorrows, happiness, and disappointments with it to the world beyond, a world that is as inaccessible to us as the lonely, labyrinthine lanes of its mind. We were in Ranthambore on a Safari organized for us by Aircel for their #SaveOurTigers initiative.